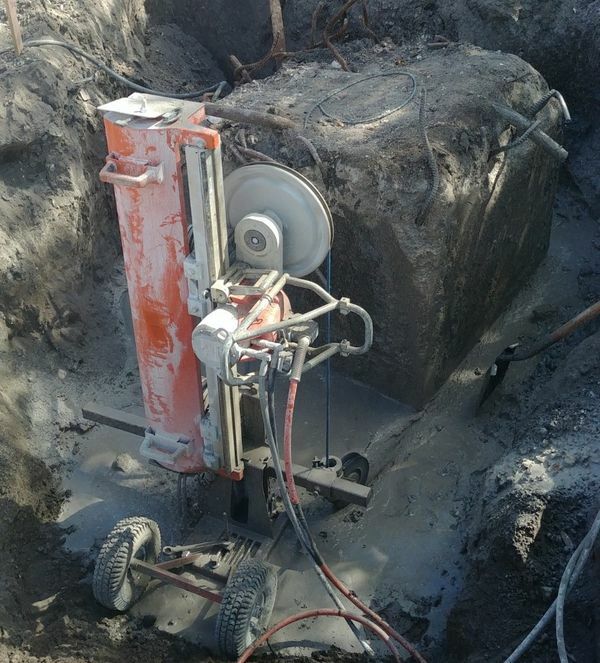 Cutting steel, concrete, brick, granite, and stone in hard-to-reach areas. Concrete wire sawing was created through great advances in diamond application technology. The steel braided wire is impregnated with small cutting diamonds similar to blades and bits used for cutting concrete. The wire is oriented in a looped fashion on the cutting plane. A hydraulic-driven wheel then forces the wire through the surface to be cut. The use of multiple pulleys allows the wire to cut any thickness at any angle, assuming there is access. The ideal applications include structures that are too thick or too large for conventional cutting means, tight areas, and submerged locations. 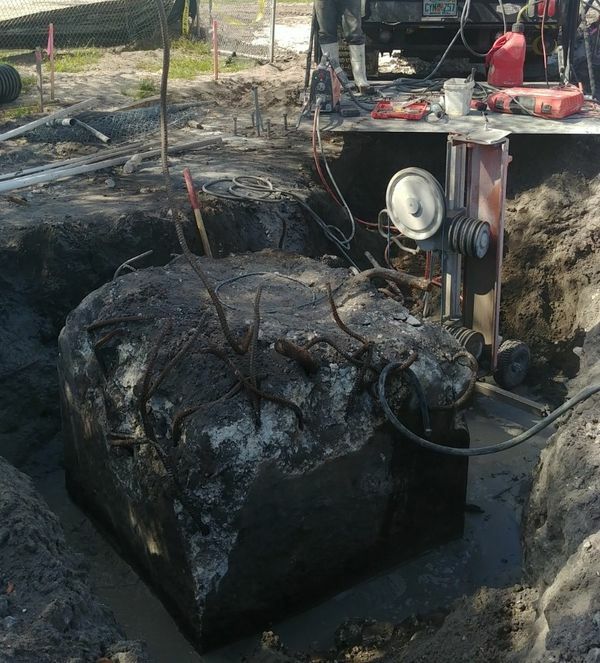 Some examples include foundation concrete walls thicker than 30” that require openings, piers submerged in water, or large barrel chillers cut down for removal. Planning, engineering, and creativity allow multiple cuts to happen simultaneously, which can reduce cutting time. The setup time is larger with this type of cutting do to site varietal conditions. This cutting process is also very safe since the operator can operate the saw from a distance and the wire quickly loses tension if there is an issue. Water is a necessary part of the process, keeping the cutting location cooled and any potential dust minimized. This process can be “messy” since water is applied in multiple locations in order to keep the silica exposure minimized. Rebar or other reinforcing is not an issue for the wire to cut. This is probably the most unique and customizable cutting operation that we can execute. Please give us a call at 734-525-5915 with any questions you have on wire cutting steel, wire cutting concrete, wire cutting brick, wire cutting granite or wire cutting stone.